Jan Knooren from Maastricht, the Netherlands, is a dutch bass player (electric as well as upright), who has performed with Chet Baker, Eric Gale, Toots Tielemans, and many others. He is also a special repairman for cello and contrabass for many concert orchestras. He studied contrabass at the music conservatory in Maastricht, Holland. His family background as beeing furnituremakers has given him a very special know-how of wood and how to work with it. He combines his musical and craftsmans abilities to produce the finest intruments. John Patitucci was born in Brooklyn,on December 22, 1959. At the age of 11 he started to play the bass. He became a real jazz-freak and played at countless sessions. He has been a member of the Chick Corea Electric Band since 1985 and has produced several solo-albums over the years. 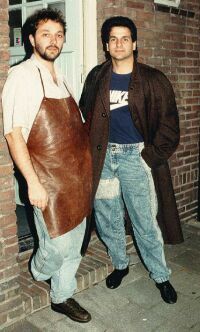 Jan Knooren met John Patitucci in 1987 in New York where they talked about the concept of the 6 string bass. This resulted in a fine instrument which John owns since that time. Patitucci is now sponsored by the multinational company Yamaha. Motohiko Hamase (1952-) quit Kelo University, Since 1976, he has been playing with Jazz groups of such leaders as Hidehumi Toki, lsao Suzuki, Mikio Masuda, Kazumasa Akiyama, Yasuaki Shimizu and George Ohtsuka. He has joined many recordings as acoustic and electric bassist. As a player he established a new style using frettless bass. He formed an experimental unit ¨Lager¨ in 1982 and continued grouping for new format of music until 1985. From the time he began his solo activities he has released five solo albums. 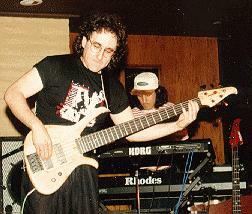 He established a theory on bass line in the ¨Bass Line Book¨ (1987), a book which concerns musical theory. He also presented a completely new tonality theory for improvisations and composition by establishing a theory concerning the development of blue notes In ¨Blue notes and Tonality¨ (1992). At young age Brian Bromberg remodeled his jazzbass to a shape he liked. 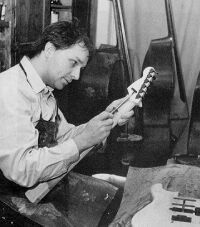 In 1990 when Jan Knooren visited him in his hometown Los Angeles they designed a 5-string bass that would look like his 4 string. Here you can see him play his 5 string in concert with Jeff Lorber. Guitarist, composer, Yasutaka Yoshioka has performed throughout Japan and in Europe. He is an exciting and sensitive musician who performs in the new direction of music. Yasutaka Yoshioka grew up in Tokyo listening to Jazz, Rock, the Classics, and Japanese traditional music. At age three he started to play the piano. At age thirteen he started to play the guitar. After high school he attended two music schools in Japan , completing six years of training in three years. In 1983 he earned a scholarship to study at Berklee College of Music in Boston There he earned the ¨Jim Hall Award¨ for outstanding performance. In 1986 he graduated first in his class from Berklee College of Music in jazz composition and arranging. He returned to Tokyo in 1986 and has worked as a freelance guitarist for many musicians and also as a leader of his own group. As a composer he has written for T.V. and other performing jazz groups. 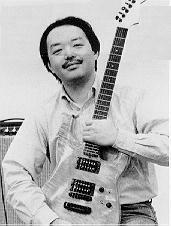 He also teaches at Musashino School of Music in Tokyo, specialising in jazz guitar, theory and workshops. You can see Yasutaka here with his guitar build by Jan Knooren. needs no introduction... Van Egdom, of international acclaim, who divides most of his time between Europe and the USA, is an old friend of Jan Knooren. They've been working together for many years on many, many projects and concert tours. It's obvious that because of the quality of Mr. Knooren's work and their lifelong friendship van Egdom endorses Knooren Guitars which combined with van Egdom's talent, virtuosity and connections introduced the instruments to many internationally known musicians... He plays, amongst others, a prototype Knooren Strat, the model called "EVE". 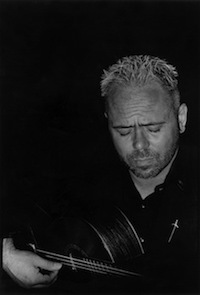 The guitars can be heard on many great CDs and concerttours of many jazz/rock and classical artists. A classical nylon string electric/acoustic is in the design stage now. Through his life as a student and the student way of life he became a member of Volumia! when they regrouped that year. Result: the musicians heart started to beat and out went the study! Early '98 the first CD with original material was recorded and it went platinum that same year, which was a record for a debutalbum. The second album in '99 went gold at the release! Musically he has experienced quite a bit: France, Germany, Belgium, Singapore, Aruba, the "Kuip", the "Arena", together with the Residentie Orkest (Jaap van Zweden), Toots Thielemans etc.. Besides Volumia! 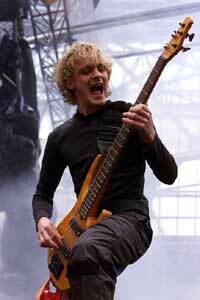 he is busy working on totally different musical challenges like rock projects and goattrance. When asked why a 5 string Knooren bass? "Simply because it's a good instrument that is super playable. Because it has a very tight low B with a total sound that is definable and can cut thru a 9 piece band.